Since 2001, AluminumBleachers.com has been a leading, global manufacturer and supplier of high-quality aluminum bleachers & grandstand systems. Our bleachers can be found worldwide in over 60 countries. Customers include schools, parks, ball fields, local/state government, construction, and the federal government. We sell bleachers to all 50 states and many of our models are on a “Quick Shipping” plan that allows us to ship certain in-stock models in (3) business days or less! Our customers can always get a direct referral to a certified & insured bleacher installer through our product experts. Aluminum bleachers are the ideal mass seating system typically used in sports fields, arenas, stadiums, schools, conferences, fairs, etc.. Bleachers are available in a number of different sizes, including custom built sizes. 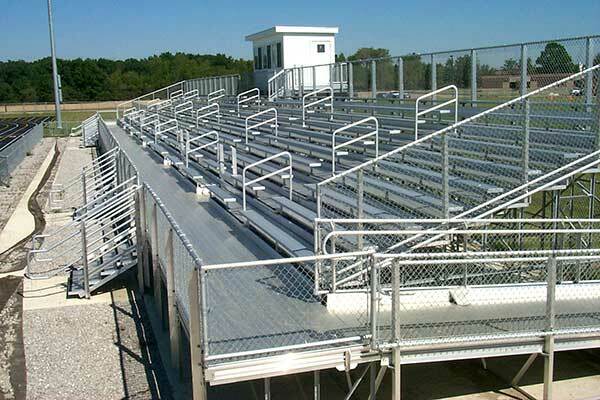 Whatever the facility you need aluminum bleachers for, they are #1 most used and cost-effective way to maximize the number of seated viewers for a particular space. We also offer ADA bleachers with wheelchair and companion seating and ramps. 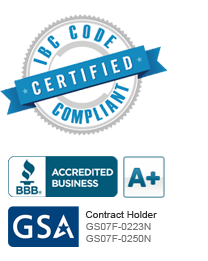 Special note: All of our aluminum bleachers are ICC Compliant and manufactured by expert technicians in the USA. When it comes to public seating, you want to make sure your facility works with a supplier with a proven track record and expertise in bleacher seating. If you have any questions, we have experts on staff who will get you the answers. Design assistance is also available. When it comes to aluminum bleachers, be sure to call the right manufacturer who is a leader in the “field” fabricating high-quality, safe and reliable seating products along with an exceptional commitment to customer satisfaction. The standard aluminum bleacher sizes are measured by the number of rows and the width of the seating planks. As a general rule of thumb, aluminum bleachers seat one spectator every 18 inches per row. So take for example a standard 3 row by 15-foot wide bleacher assembly and it will accommodate 540 inches of seating. Divide 540 inches by 18 inches per spectator and you have an approximate 30-person seating capacity. 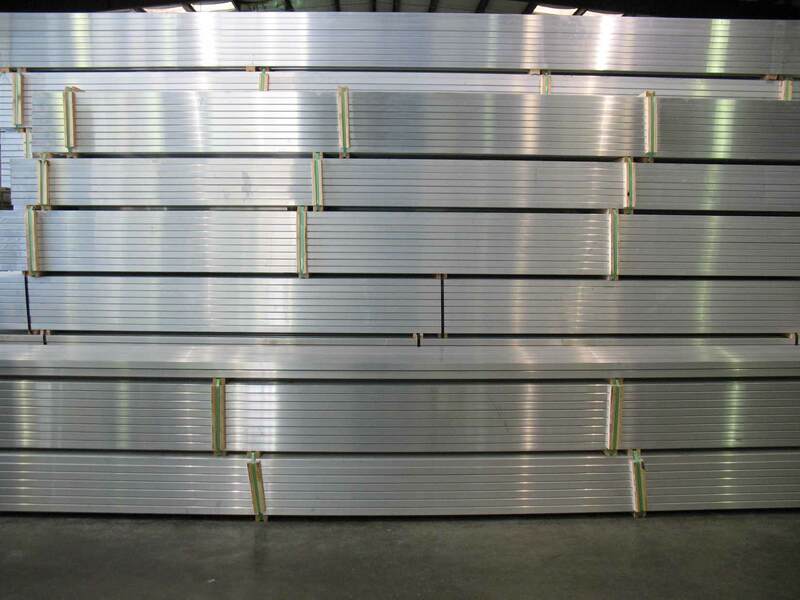 The following are standard sizes of aluminum bleachers that you can order from AluminumBleachers.com. If you need event or sports bleachers with a different configuration, call us. We can create custom bleachers to comply with your site or design requirements and seating lengths. We offer FREE layouts as well. 5 row – lengths from 15 to 33 feet with chain link guardrail systems and double footboards. 10 row – lengths from 15 to 33 feet with chain link guardrail systems and double footboards. As we indicated, if these standard models don’t meet your particular specifications, or you want to add wheelchair ramps or access to press boxes, band platforms, etc., contact us. We customize bleachers on a regular basis to meet the clients’ needs. Our engineers and draftsmen have many years experience in bleacher design. All of our aluminum bleachers feature clear anodized aluminum seats, mill aluminum slip-resistant foot planks, galvanized steel hardware and mill aluminum cross braces and angle framing to be sure you are installing superior-grade bleachers at your facility. We also provide aluminum players seats and scorer tables. We proudly manufacture our products in the USA in a new 70,000 square-foot, state-of-the-art facility. That facility also follows best practices to recycle aluminum materials. Talk to the Bleacher Experts. You can count on us for quality craftsmanship, expert advice, and superior customer service. Our bleachers have been installed at such prestigious locations as the University of Notre Dame, University of Chicago, Edwards Air Force Base, Golden Nugget, and General Motors to name just a few. For nearly two decades, we have been the preferred supplier of aluminum bleachers to thousands of schools, parks, recreation centers, colleges, universities and other venues in the US and around the world. (Note: Remember, if you need seating quickly, we can ship 3 row and 4 row outdoor bleachers in just a few business days!). Environmental note: AluminumBleachers.com distributes bleachers from a state-of-the-art facility in Florida that follows environmentally-friendly practices for manufacturing. In a one-year period, the facility recycled nearly 150,000 pounds of aluminum scrap that went back into the fabrication of aluminum bleachers and not into a landfill.